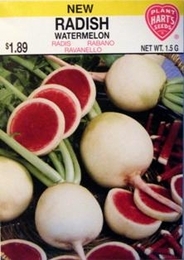 This unusual radish looks like a watermelon when sliced. The round white roots have shoulders and are 2 inches in diameter. The inside flesh is red to pink sweet and crisp. Large tops make for easy picking. Best when picked small. To grow the best radishes the crop must grow quickly therefore the soil must be loose and enriched with fertilizer. Water in the absence of rain.